A lazy Saturday afternoon it was. And the earth shook. As I sat cutting fresh green ladies fingers in my kitchen, I suddenly felt the vessel shudder. Was it my hand moving? Probably it was my BP going low. But when the cups hanging on the cabinet started to clatter, I realized it was a quake. By then, hubby had realized it too. Picking up our two little ones we ran outside our apartment. We took the stairs down the 6 floors. By this time, almost the entire colony had collected below, at a distance from the building. We felt it a second time again. This time it was milder, a sudden jolt as though the ground below us was moving. 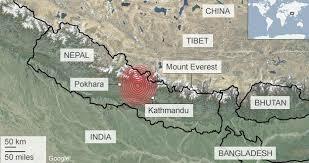 Saturdays Himalayan quake has left the country of Nepal battered. It is the worst natural disaster affecting the country in all of 80 years. Thousands have lost their lives. Many more have lost their homes, the basic need for existence. Sitting in Delhi, I just felt a tremor. But it did get me thinking!!! For a moment a chill shiver went down my spine. The first thought- my life and my family is most important. All other things in life are secondary.I looked up at my building and realised that a disaster of such magnitude could practically wipe out everything I have. My home and my family too. I clutched my two daughters closely… the secure feeling was blissful. Life is the most precious thing!! Scientifically an earthquake is the displacement of the earth’s crust along the lines of weaknesses. An earthquake of medium intensity can cause enough destruction to life and infrastructure, which cannot be rehabilitated properly for a decade to come. It is surely Mother Nature at her fury. HI Ramya, Life is indeed precious. The security of the loved ones is definitely blissful. But we in a normal life situation take everything for granted. When hit by an adversity we SEE the truth. So very timely that you wrote about this. I spent two weeks in the beautiful country of Nepal only arriving home one month to the day before the earthquake destroyed it. I was in Kathmandu, Pokhara, Chitwan, and all through the valley. Having stood at all the significant spots that crumbled was powerful. You are right that your precious loved ones are what is important. And I was so happy to finally hear word yesterday that the friends I made during my trip are safe along with their families. Now I need to figure out the best way to help! I was wondering what it would feel like in India, and now I know. Gina.. I totally understand what you must be feeling now. And am glad your friends are fine!!! THere is nothing more precious than loved ones….. Incidents like this remind us of how fragile life. Well written thoughts. I was in Gurgaon, pretty scary it was. Indrapreet….Fragile!!! THats the word… I was missing out on when trying to explaing what was in my mind… Bang on!!!! Thanks for sharing your thoughts.